Use a 11 inch by 7 inch shallow tray. Or as I have paper cup cases. Grease the tray well with butter on a paper towel. If you have a slab of toffee then put it in a plastic bag and break it up with a rolling pin. Then put the toffee and butter ot margarine into a pan. Then add the marshmallows and melt then on a low heat, stirring all the time. When everything has melted and blended together. Then take the pan off the heat and gently stir in the rice crispies. Now spoon the mixture into the tray and press down gently with the back of a metal spoon. Finally leave the mixture to cool. then cut up into slices and serve. 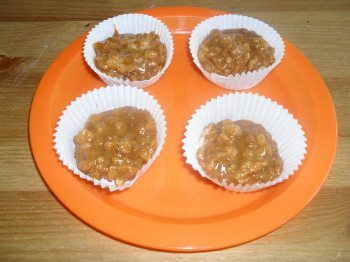 This is a reall easy toddler dessert that is simple to make and the kids will love.